I was going through the pictures I took in Bethesda, MD over the past couple of days and found a few more to share with you. This was just after noon on February 8th. Two days after the snow ended. 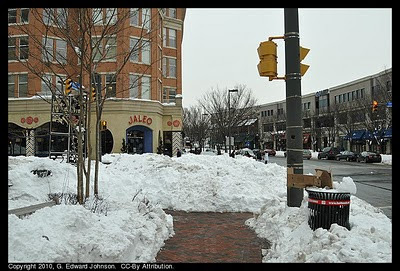 Wisconsin Avenue is still very slushy and messy. 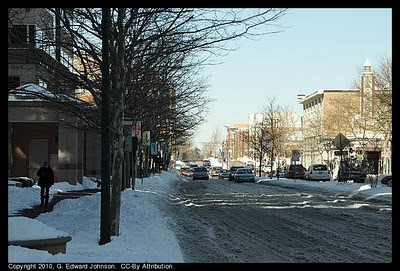 Old Georgetown Road (on the right) is just as bad if not worse. Another one from the 8th, just after noon. Two lanes getting through the slush on southbound Wisconsin Ave. This is a heavily traveled stretch of road in Bethesda. 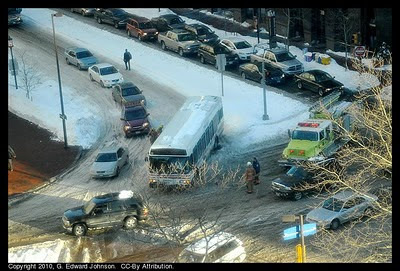 This bus was stuck for a couple of hours before the firefighters showed up. They were unable to free it and so it stayed there for a couple more hours before breaking free. 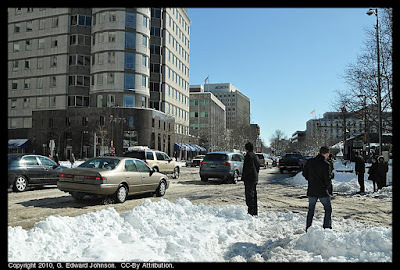 Feb 8, East-West Highway at Wisconsin Ave. The sidewalk used to keep going. Now there is a huge pile of snow at the corner of Woodmont Avenue and Elm Street. Feb 9, 3:30pm. 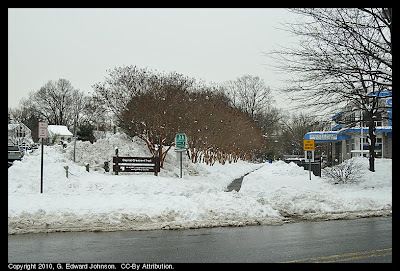 They might have trouble keeping the streets and sidewalks plowed but the Capital Crescent Trail has been cleared of snow. Feb 9, 3:30pm This was only about 5 minutes before the next snow storm started. Hey Edward, thanks for the mention on Sum Random Knowledge and you've got some great pics on your blog! You've captured a good combo of cars and people on Wisconsin making the most of that brief bit of sun, and I love the one where you've photograped the traffic from above. Wouldn't mess with that bus! Glad you like them Tom. It is nice to have another active Bethesda Blogger.